Alpha Goombi, a Kiowa Indian who was raised in Carnegie, said she grew up with a great deal of prejudice and low self-esteem and was not allowed to be a member of the white church in town. 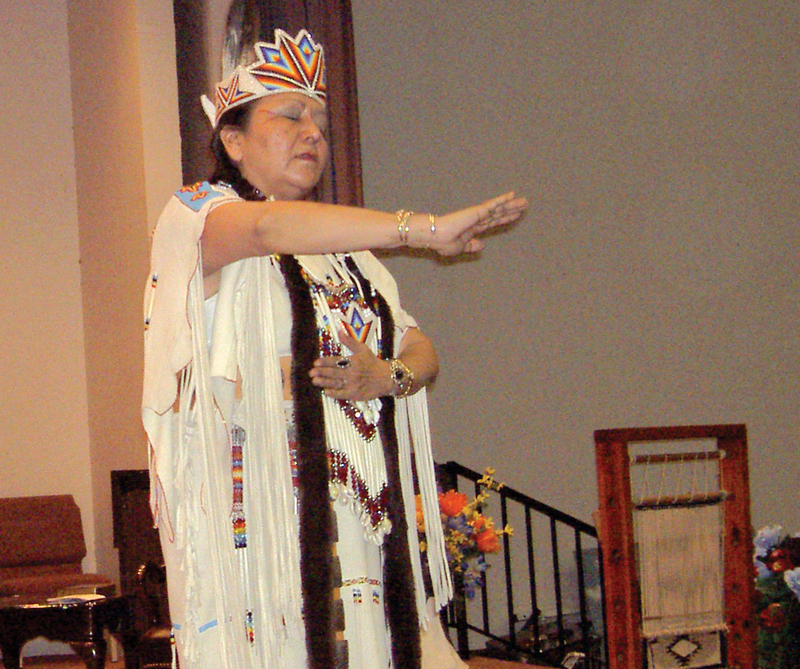 Speaking to more than 100 women at the first national conference for Native American women at Oklahoma City, Glorieta, Goombi said the Mormons were about the only people who ventured out to her family’s house. She said her family was the poorest of their tribe, and she wanted to get out of that lifestyle. She enrolled at the University of Oklahoma and began a major in drama. “I wanted to change the way Native American women were portrayed in movies,” she said. “I aspired to be the first Native American actress to win an academy award. However, while in Norman, Goombi met Eddie Lindsey, current BGCO church planter, who was planting a church in the area, and there she met Jesus. Today, Goombi and her husband are North American Mission Board missionaries serving on a reservation in Omaha, Neb. “God does have a sense of humor, taking a devout OU fan to enemy territory,” she quipped. In Nebraska for 18 years, the couple just over a year ago established the first church on the Omaha Indian reservation. “It’s going to take Native Americans to reach Native Americans,” she observed. 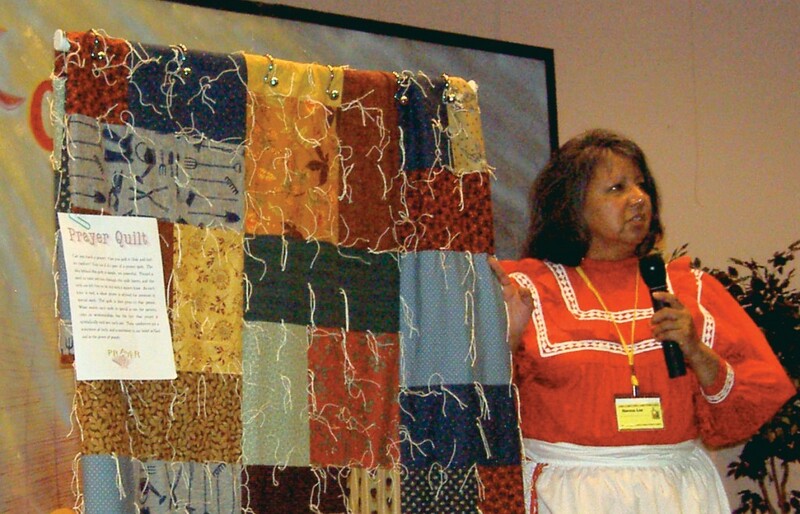 Goombi urged the women to help her launch a prayer against alcohol for the Indian people. Kaye Miller, national WMU president, urged the women to heed the call of God in their lives. Raised by missionary parents in Thailand, where her father was a surgeon and her mother a nurse, Miller said it was when her father was explaining to a leper that Jesus could heal him inside as well as outside, that she knew she needed Jesus. As a nurse, she said God has called her to minister to those with modern-day leprosy-AIDS. Joyce Hamblin, chalk artist and member of Glorieta, said she has lived in an Indian housing addition for six years, and realized she has not been a witness. But she said she asked the Lord to give her a chance and within two days, a neighbor came to her door, told her her husband had left her and asked Hamblin if she would drive her to work. Then she asked her to baby-sit her children. Two days after that, another neighbor called saying she had a new sewing machine and didn’t know how to thread it, and asked for her help. Augusta Smith, from Cedar Tree Church in Tahlequah, did the theme interpretations during each session. She said these are acts of Satan and a commentary of what can happen when strong chords are disconnected. In addition to the general sessions and workshops, the women were involved in mission activities across Oklahoma City, including prayerwalking, making prayer blankets to be given to persons with special needs, cutting out “positive bags” for women who test positive for pregnancy at the Hope Pregnancy Center, conducting a block party, organizing and packing hygiene items to be given to people who come to the Baptist Mission Center, and cleaning, doing yard work and planting flowers at the Mission Center.